In the following post, we explore parts of Chicago best-liked by our excursionist Becky Sigman, which she revisited during a recent stay with friends. Becky enjoys being out of doors and we experience her version of ‘urban nature’ in this city of 2.7 million people. Let’s accompany Becky through the Gold Coast and The Loop, ending our journey in Belmont Harbor. 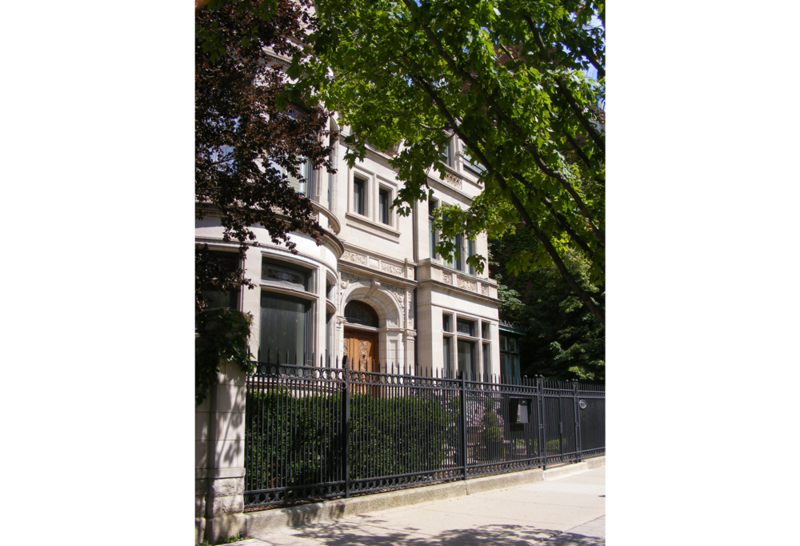 Becky states the Gold Coast, with its tree lined streets and lovely historic homes, is simply a Chicago “must.” As the name implies, this is one of Chicago’s most affluent neighborhoods. The residential architecture is eclectic, encompasses numerous styles, incorporates a variety of materials, and is extremely elegant. The townhouse on the bottom has a bay window that addresses the street. It accomplishes two very important functions. First, it allows in considerable natural light, which is rare in a city townhouse. Second, it tempers the scale of the façade, making the residence feel more human scale. 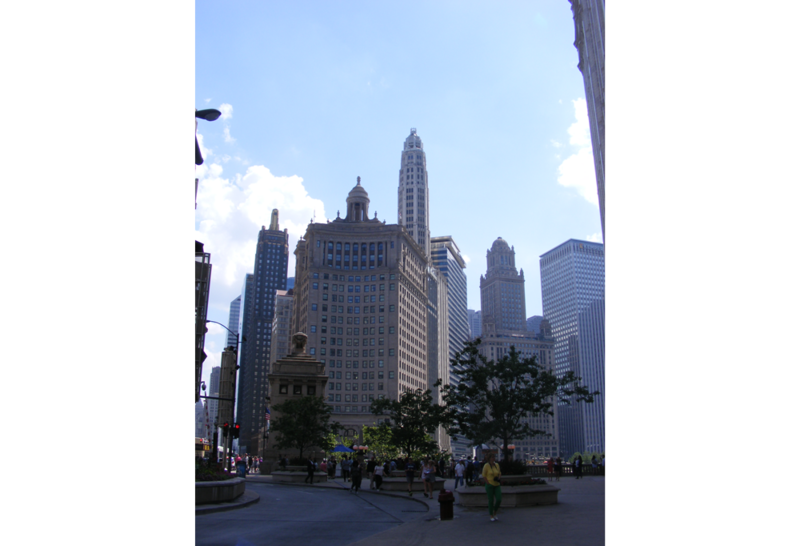 The Loop, the city of Chicago’s historic center and financial heart, is a bustling area, particularly Michigan Avenue. One of the things Becky appreciates most about this neighborhood is its very urban scale. The fire of 1871 presented the city with an opportunity to look forward, reimagine itself, and via a series of architectural movements centered in the area, ultimately gave rise to the skyscraper. 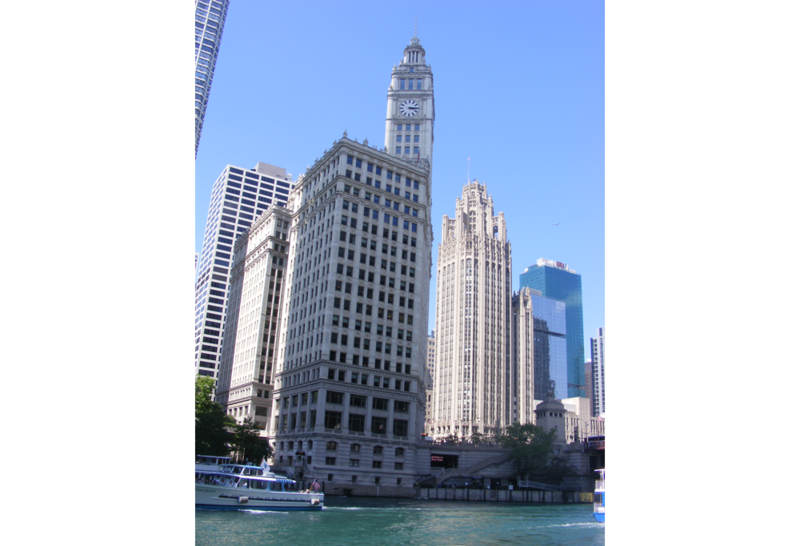 Chicago architecture can be separated into several time periods; the First Chicago School, the Prairie School, the Beaux Arts, and the Second Chicago School. What we now call the skyscraper emerged shortly after the 1871 fire, during the First Chicago School (1872-1899) and the Beaux Arts period (1893-1920). These were Becky’s primary focus while visiting the Loop. The William Wrigley Jr. Building (1919-24) is in fact two structures. The southern building with the clock tower was completed first. The northern building was built later, and as seen in the photo above, was set right on a bend in the Chicago River. 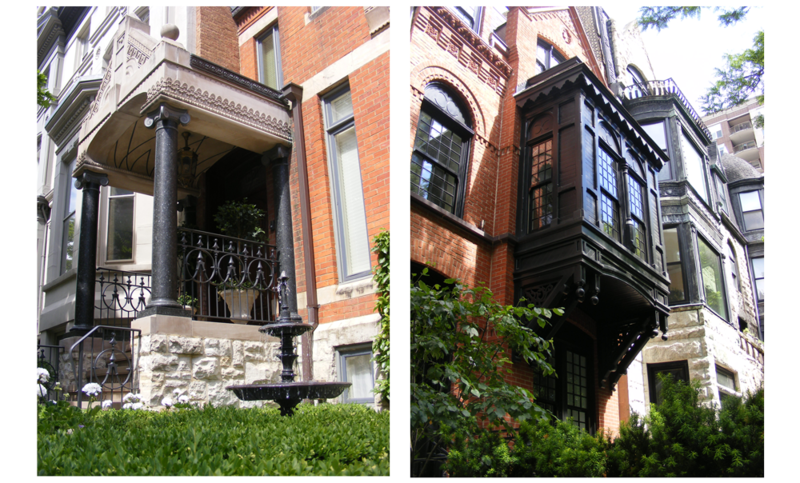 The architect was Charles G. Beersman of the Chicago firm Graham, Anderson, Probst & White. On the opposite side of North Michigan Avenue is the Tribune Tower. This building was the result of an international design competition, held in 1922, to honor the 75th anniversary of the Chicago Tribune. John Mead Howells and Raymond M. Hood of New York submitted the winning Gothic design. 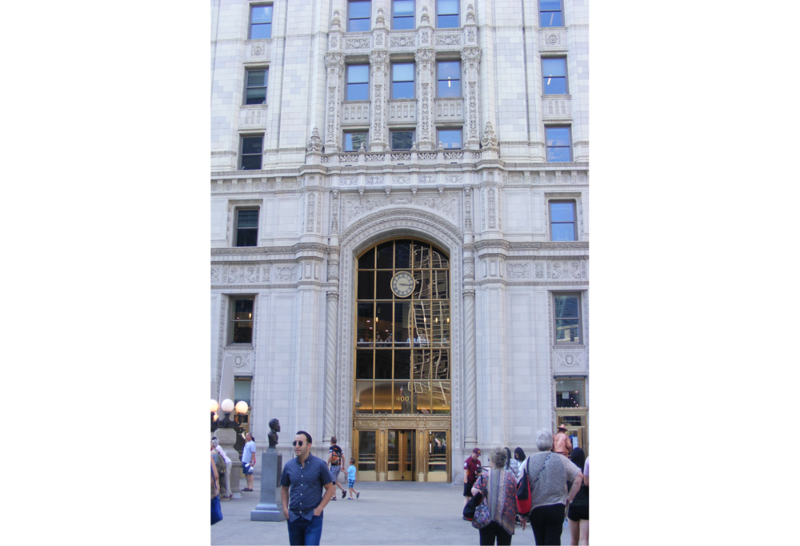 Becky also loves to look at the more intricate and beautiful craftsmanship seen in historic high-rises such as the Wrigley Building and the Tribune Tower. In the closeup below, we stand opposite the Michigan Avenue main entrance of the Wrigley Building. 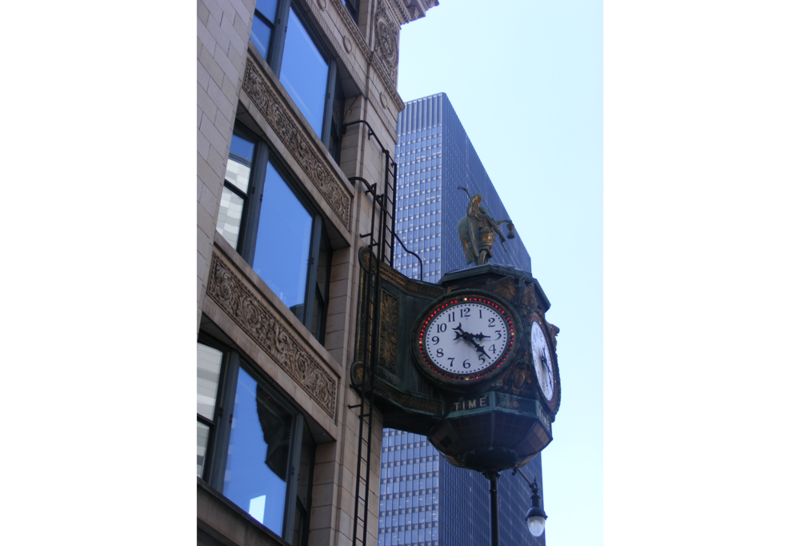 The Father Time clock, circa 1926 seen just below, is attached to the Northeast corner of Jewelers’ Building at 35 East Wacker Drive. The clock was a gift from the Elgin Watch Company, which had offices in the Jeweler’s Building. It is not easy to tell, but the sculpture of Father Time on the top of the bronze clock is 5’ tall! 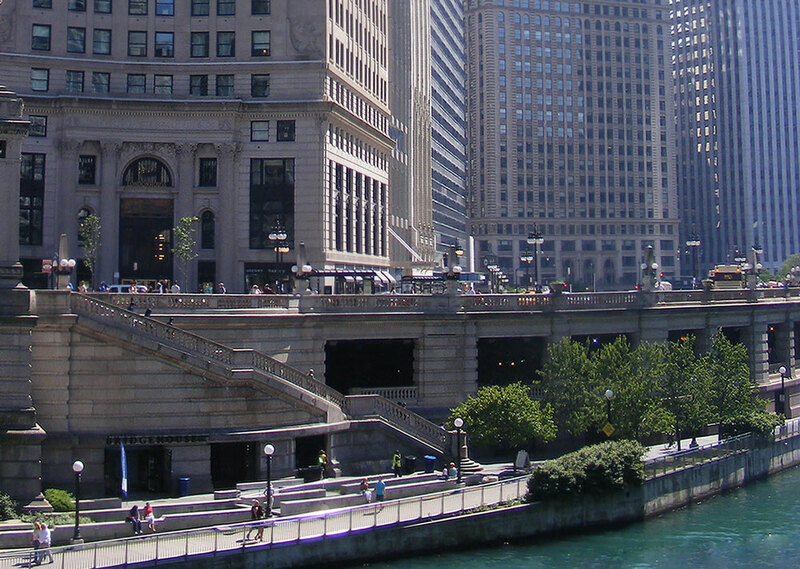 The Chicago Riverwalk is just one of the travel ways where pedestrians are separated from vehicular traffic. The lakefront trail is another. This is an aspect of Chicago’s ‘urban nature’ which Becky finds very hospitable. 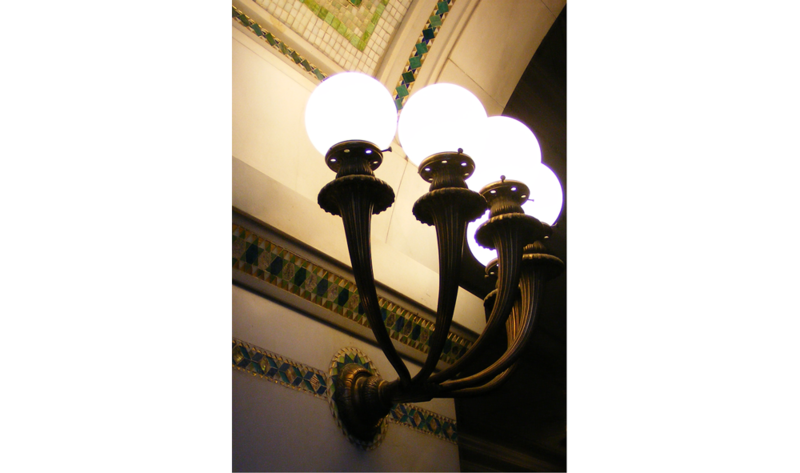 Another stop on Becky’s tour of the Loop was the Chicago Cultural Center. Built in 1897, it began life as the city’s first public library. 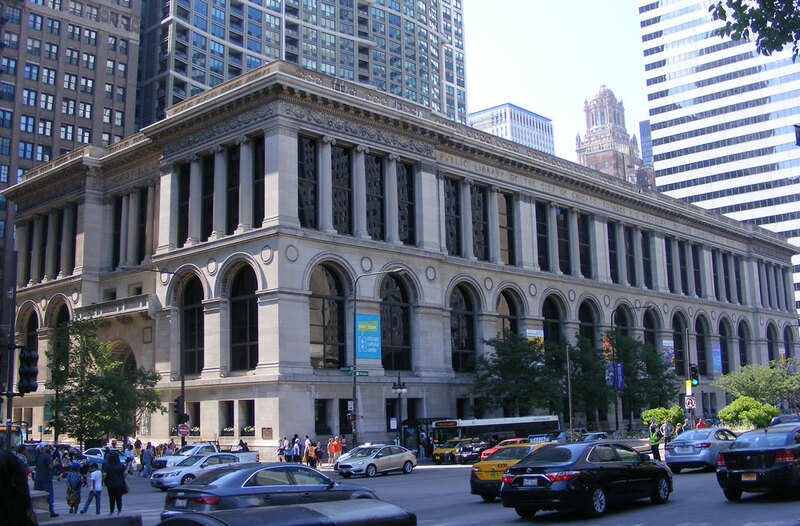 Charles Coolidge, of the firm Shepley, Rutan and Coolidge, designed the Beaux Arts style building at the request of the Chicago Public Library Board. The bands of mosaics seen above were designed by a gentleman named Robert Spencer and executed by J.A. Holzer, a former Louis Comfort Tiffany Studio craftsman. Becky took the photo because she is enamored with the idea of embellishing building interiors with “public art.” Not seen in this post, but worthy of mentioning, is the world’s largest Tiffany glass dome, located on the south side of the building. 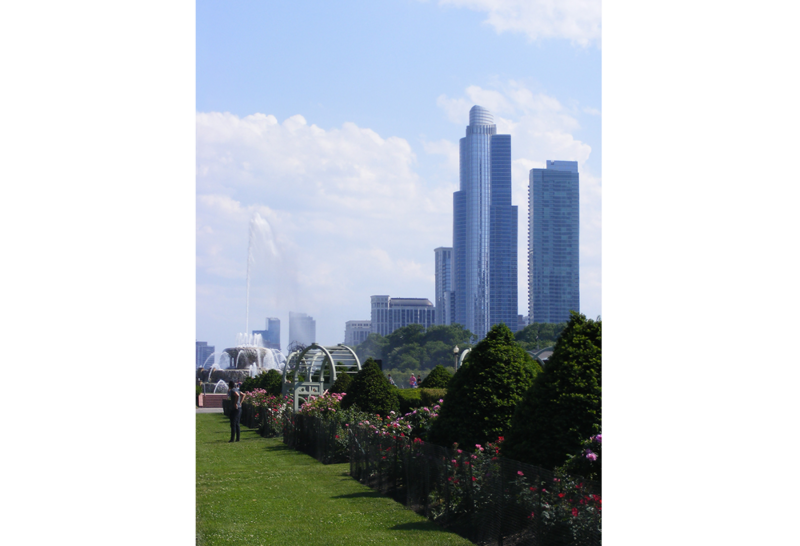 Of Grant Park (technically located in the South Loop), Becky remarks it is a great example of the “contrast between open space and urbanity in the heart of the city.” The Bassin de Latone at Versailles inspired the Buckingham Fountain, a Beaux Arts piece. It was envisioned as an axial termination point in the 1909 Plan of Chicago and is the focal point of the park today. 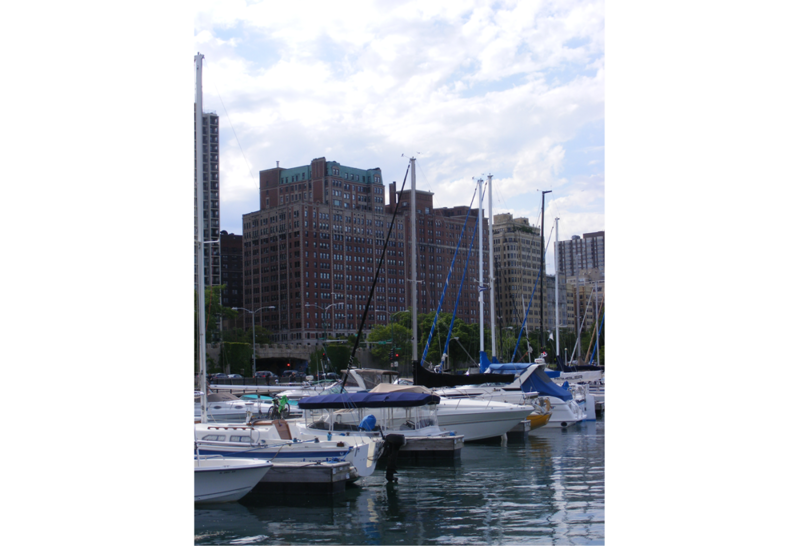 Becky has included a photo of the Chicago skyline, taken while walking the lakefront trail next to Lake Michigan, and the accompanying map excerpts from a Lonely Planet guide to Chicago, to illustrate a few ways in which the city embraces the lakefront. This journey, and our impression of the Windy City courtesy of Becky, ends in Chicago’s largest park. Her northern most stop was Belmont Harbor, located in Lincoln Park.